7 Trees That Cause the Most Plumbing Damage - Are Any in Your Yard? What kinds of trees do you have in your yard? You need to find out! 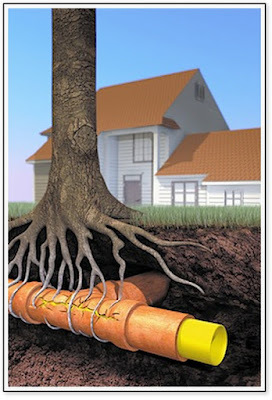 To protect your plumbing you must know what kind of trees you have and where they are planted in relation to your sewer lines, since some trees are more trouble than others for your plumbing. 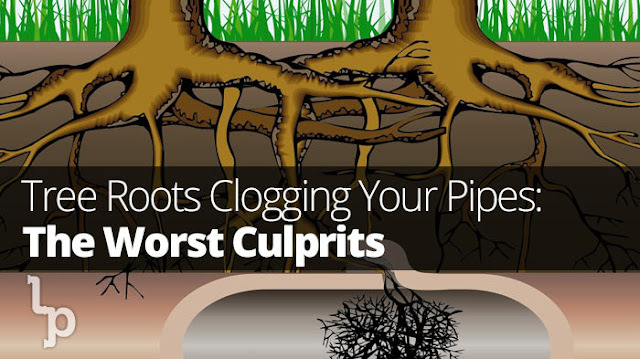 Tree roots can exploit tiny cracks or holes in your sewer pipes, and use them to invade! It's a very common problem in Central Texas to have tree roots clog, crack and even completely destroy parts of sewer lines. Did you know that tree roots can be 2-7 times as long as the tree is tall? These roots will travel long distances seeking water. Roots can actually sense water vapor, and will follow the trail of leaking moisture straight back to small cracks, badly sealed joints, or pinholes in your pipes. Was your home built 1950-1986? Then you very likely have cast iron sewer lines which are very deteriorated and especially vulnerable to root invasion. Read more here. 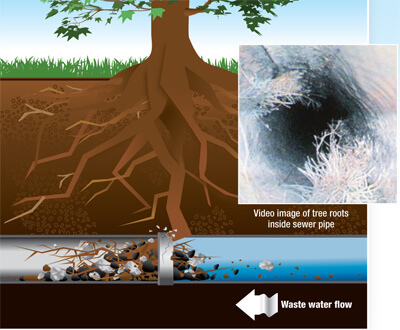 As you can see in the diagram above, roots will invade the pipe with many hair-like masses at each hole or crack. The roots will grow quickly and catch toilet paper, debris and grease over time, adding to the blockage and slowing the passage to the main sewer. If left untreated, the roots will continue to get bigger and exert more pressure on the pipe, eventually cracking it open and causing the total failure of your pipe. The roots of some trees are more likely than others to send moisture seeking tendrils searching for the flaws in your pipes. If your water pressure is low, your water bill is high, your house is older, or your toilets are gurgling, you may have roots in your sewer pipes. Call The Plumbinator and we will run a special, high-tech camera down your line to see if your pipe looks like the one in the video image above, or (hopefully not) the pipe depicted below. Please note: Tree roots can't invade your water pipes, since those are under pressure, but if a crack or hole exists in a water pipe, roots will find it and wrap around the pipe, possibly displacing the pipe and causing further damage. If you do have roots in your sewer pipes, call The Plumbinator and we'll pull them out, like Tim did below. Yikes! So which trees are the worst offenders? Here are the top 7 trees voted most likely to invade. Good Luck and call us if you need us! Exceptions and Add-Ons: Permit we secure from your city/county will add $50-$300 and will be added to your bill at actual cost, no markup.Need a new pan line to bring your heater up to code? Add $150-$300Is your heater on the second floor or in the attic? Add $100. Call The Plumbinator today! Sale ends soon! 512-786-1771. Thinking about a tankless water heater instead? We are Navien tankless experts. Read more and give us a call. Was Your Austin-Area House Built 1950-1986? Then Your Sewer Pipes May Be In Big Trouble. If you have an older home in Austin, you may have a ticking time bomb under your slab in the form of cast iron sewer pipe. All cast iron sewer pipe will need to be completely replaced before your house turns 50 years old. If your house was built 1950-1969, it's already time to replace before your house is flooded with sewage! Houses built in the 1970s will need complete replacement in the next 10 years. It's not a question of IF, it's a question of WHEN. Why? Cast iron sewer pipes only last 50 years before they deteriorate beyond repair and start leaking raw sewage into your yard or living room. If you have an older house in Austin, call us to come out and do an inspection. We'll let you know if you can wait a few years, or if the pipes are already starting to leak sewage into your yard or house. Do I Need To Hire a Licensed Plumber? Your Common Questions Answered! Help! I have a plumbing problem! Should I try to do it myself, hire a handyman or call a licensed plumber? In Texas, there are only TWO legal options when you have a plumbing issue: 1) As the homeowner, you can fix your own plumbing, OR 2) You can hire a state-licensed, insured plumber who is working under a valid Master Plumber's number. If you have your plumbing work done illegally, it could be a costly mistake, since damage from illegal work isn't covered by your home insurance. Read more below. Help! I've Got a Mystery Water Leak!